In January 2018, Bianca Andreescu competed in the qualifying round of the Australian Open for the first time in her career. It didn't go very well. But fresh off her most successful run on tour to date, the 18-year-old Canadian is looking for a better outcome starting Tuesday night. In January 2018, Mississauga, Ont., native Bianca Andreescu competed in the qualifying round of the Australian Open for the first time in her career. There was reason for optimism. Andreescu's 2017 season, her first full year on the pro tour, had been promising. The five-foot-five Canadian recorded four wins over top-100 players, including world No.13 Kristina Mladenovic in the second round of the Citi Open in Washington. Andreescu made her main draw debut at the Rogers Cup in Toronto, where, despite a first-round loss, she impressed the home crowd with some incredible shot making. However, Andreescu's first appearance at the Australian Open didn't go well. The Canadian won just two games as she was defeated 6-1, 6-1 by Romania's Alexandra Dulgheru in the first round of the qualifying tournament. Canadian Fed Cup captain Sylvain Bruneau was disappointed, as he knew how much potential Andreescu had. "Bianca seemed a little lost," said Bruneau after the match. "She's a really talented player and is capable of doing lots of things out there … at the moment she's lacking direction in her matches." As the year continued, luck didn't seem to be on Andreescu's side. In April, the teenager had to be taken off the court in a wheelchair after suffering severe cramps in the third set of her Fed Cup match against Ukraine's Lesia Tsurenko. In July, Andreescu suffered a back injury at the Granby challenger in Quebec, forcing her to withdraw prior to the semifinals. As a result of the injury, she played just one match over the next 12 weeks. But the changing of the leaves brought an upswing in the Canadian's fortune. In October, Andreescu won five straight matches to capture an ITF $25,000 US title in Florence, S.C. 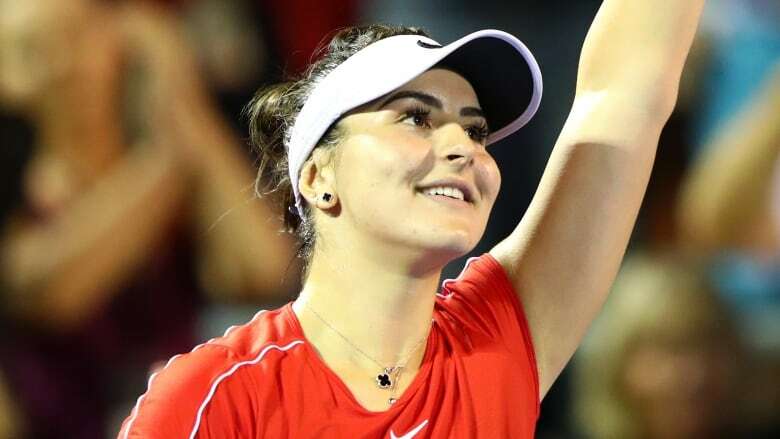 In November, she won another ITF title in Norman, Okla.
Last week, Andreescu won seven consecutive matches, three in qualifying and four in the main draw, to reach the final of the 2019 ASB Classic in Auckland, New Zealand. Her memorable tournament was highlighted by a straight sets, second-round win over defending Australian champion Caroline Wozniacki, and a third-round victory over former world No. 1 Venus Williams. In seven attempts, Andreescu has only successfully navigated her way through singles qualifying once at a grand slam event — Wimbledon in 2017. It won't be any easier this year. Andreescu will play her first qualifying match at approximately 11:05 p.m. ET on Tuesday against 19-year-old Brit Katie Swan. Swan was the runner-up at the girls' singles draw at the 2015 Australian Open, and has been named to Great Britain's Fed Cup team this year. In the final round of qualifying, Andreescu could face talented 24-year-old Czech Tereza Smitkova, who made the Round of 16 at Wimbledon in 2014. Even if the Canuck is able to win three matches in qualifying, she would likely face a well rested opponent in the first round of the main draw. That said, that trajectory is exactly what Andreescu dealt with in Auckland last week. "Right now it's not easy to have to turn around and play qualies," said Louis Borfiga, Tennis Canada's vice-president of high performance and athlete development. "But that's part of the experience to become a champion."